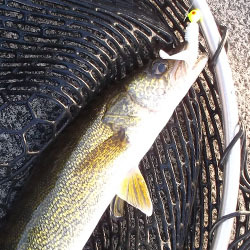 In spring, Rice lake walleye can be found scattered in the weedflats around Bewdley, cast a silver rattle spot, retrieve at medium speed in 5-8 ft. of water, try to cover a lot of water, this area is quite large. If the bite is off, try trolling in this area with a chartreuse worm harness. 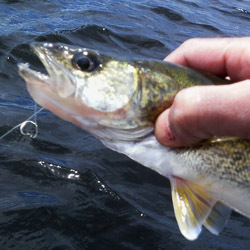 In spring, lake Scugog walleye concentrate at the mouth of the Scugog River. Troll in the main channel with black, purple, or chartreuse worm harnesses. The key is a slow presentation, with the blades of your harness just barely spinning. Lake Erie is the warmest and most biologically productive of the Great Lakes, and the walleye fishery is widely considered the best in the world. Every year tons of walleye are harvested from the lake, both from recreational angling and commercial fishing.